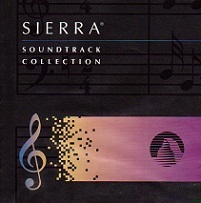 The Sierra Soundtrack Collection, features 20 songs by composer Mark Seibert. Co-produced by Jeff Hall in his studio, the CD contains songs from King's Quest V, Codename Iceman, Police Quest 2, Conquests of Camelot, Quest for Glory I, Conquests of the Longbow and the Theme of King's Quest VI "Girl In The Tower", which was also released as a single CD. Mark describes how each song came to be in the CD booklet. Released in 1992, the CD is hard to find these days and considered a collector's item. Mark Seibert introduced the CD as follows: "When starting this project it was hard to pick from a couple hundred or so pieces of music that I've written over the last few years for Sierra On-Line computer games. I thought of all the people who have written to me about their favorite songs or spots in games, songs that people here who worked on the games enjoyed, and songs that were special to me. After realizing that all that wouldn't fit on one CD I cut it down to the songs included in this project. I hope you enjoy listening to it as much as I enjoyed making it."